Over 55 years after its inception, the Division of Cardiac Surgery at UCLA continues the legacy excellence of innovation, research, and quality. The first blood oxygenator and heart-lung machine was built in 1955 by Dr's Maloney and Mulder. 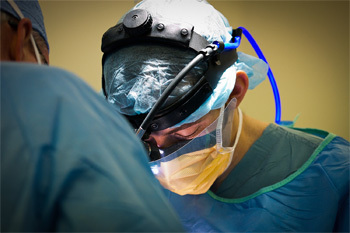 Soon after, many pioneering operations were performed on patients from around the world. Upon arrival of Dr. Hillel Laks in 1981, the division also developed extremely successful pediatric and transplant programs. In 1982, the first heart transplant in Southern California was performed at UCLA. The novel Alternate Donor Program, now used around the country, has enabled thousands of patients who did not meet ordinary criteria for transplantation, to have a new chance at life by allowing them to receive organs. UCLA continues to pioneer new technologies with emphasis on patient safety, comfort and recovery. Minimally-invasive techniques have given patients at UCLA a chance at earlier recovery. The UCLA Robotic Heart Surgery program, established in 2008, enjoys a national reputation for quality and success, and draws patients from around the world. The doctors at UCLA are using advanced heart surgical techniques using robotic surgery technology, which means smaller incisions, less blood loss and faster recovery.